WHAT’S IN YOUR SUNSCREEN? | What's Green with Betsy?!? For the past several decades, we have been told it is imperative to wear sunscreen, even in winter, to block the sun’s harmful ultraviolet rays. New research is showing however, that many, including the bestselling sunscreens, are not only ineffective but also unsafe. The Environmental Working Group, an environmental research and advocacy group, claims that four out of five brand-name sunscreens either provide inadequate sun protection or contain chemicals that may be unsafe. They analyzed over 1400 SPF products and concluded that 7% of the products with SPF ratings of 30 or higher did not protect against UVA rays and found that only 39 of the sunscreens met the group’s criteria for safety and effectiveness. The FDA, which has not issued any new sunscreen guidelines since 1978, has said that SPFs greater than 50 are misleading. There are new disclosures about potentially hazardous ingredients, in particular new data about Vitamin A and skin tumors and lesions. Scientists are now coming to the conclusion that heavily-used chemical sunscreens may actually be increasing the incidence of cancer. To add to the confusion, we now learn that the majority of Americans, particularly in the Northeast, are Vitamin D deficient, a vitamin that comes from the sun and helps protect against cancer, and that sunlight exposure may decrease cancer rates. What do we do? Get informed. Carefully read your sunscreen label for unsafe ingredients like Oxybenzone, Vitamin A (retinyl palmitate) and insect repellent. Check out the Environmental Working Group’s list of the safest sunscreens. Top rated products contain zinc or titanium minerals for UVA and UVB protection; experts recommend wearing sunscreen everyday, even when it’s raining! According to the International Agency for Research on Cancer “sunscreens should not be the first choice for skin cancer prevention and should not be used as the sole agent for protection against the sun”. 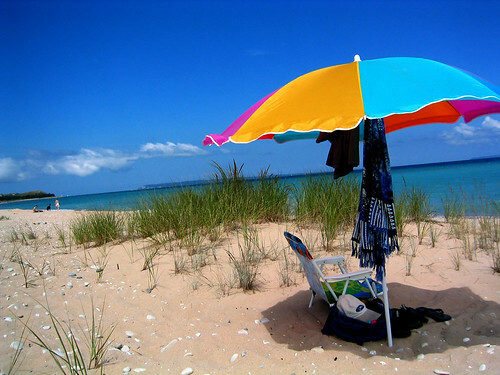 Make sure you wear sunglasses, a hat and protective clothing in the sun and use an umbrella at the beach. Stay out of the sun during the peak hours 10 to 2. Take precautions, but enjoy the sun!